The Prince of Wales says he will stop speaking out on topics he feels strongly about when he becomes king, as he is "not that stupid". He has campaigned on issues such as the environment for decades, but says he would not do the same as monarch. 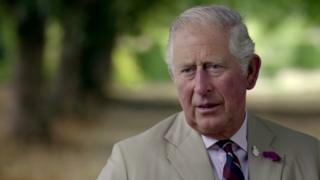 Speaking in a BBC documentary to mark his 70th birthday, Prince Charles said the idea that he would continue making interventions was "nonsense". He said he would have to operate within "constitutional parameters". He has campaigned on issues including the environment, wildlife preservation, architecture and the use of GM crops. In the hour-long programme, he was asked about what some people have called his "meddling", but said he had always tried to remain "non-party political". He said: "I think it&apos;s vital to remember there&apos;s only room for one sovereign at a time, not two. "So, you can&apos;t be the same as the sovereign if you&apos;re the Prince of Wales or the heir. "But the idea, somehow, that I&apos;m going to go on in exactly the same way, if I have to succeed, is complete nonsense because the two - the two situations - are completely different." Asked whether his public campaigning would continue, he said: "No, it won&apos;t. I&apos;m not that stupid. Documentary film maker John Bridcut, who followed the royal for 12 months, said Prince Charles "bridled a bit" at the use of the word meddling, and instead preferred to think of his interventions as "motivating". The heir to the throne said: "If it&apos;s meddling to worry about the inner cities as I did 40 years ago, then if that&apos;s meddling I&apos;m proud of it." He has spent his adult life trying, as he puts it, "to make a difference". Often that has led the Prince of Wales to speak out about topics about which he feels deeply: the environment, GM crops, inner cities, architecture, education, homeopathic medicine and others. Prince Charles has been accused of "meddling". It has, on occasions, caused irritation within the government departments which have had to respond to his heartfelt "black spider" handwritten letters raising, always courteously but often insistently, some issue which has come to the prince&apos;s attention. It has all given rise to a greater concern. Does Prince Charles fully appreciate that, when he succeeds his mother and becomes Britain&apos;s king, these interventions will have to stop? Those who know him have said for years that he does understand that there is a line which, as sovereign, he could not cross. They&apos;ve said that privately he fully understands that, as king, he would have to stop his "campaigning". Prince Charles himself has always baulked at saying as much publicly. He&apos;s said to feel that any reference to how he will function as monarch could be seen as being disrespectful to his mother. However, with the Queen now in her 93rd year, and with Prince Charles about to celebrate his 70th birthday, he has finally said - publicly and explicitly - that he does recognise that his interventions on matters of public debate will have to stop as soon as he becomes king. "You operate," he says in the BBC documentary, "within the constitutional parameters". It is reasonable to suppose that his assurances will be heard with some relief within Whitehall and the corridors of power. Mr Bridcut said: "People who think he&apos;s hanging around, longing to be king, are very mistaken. "It&apos;s not something he&apos;s dying to assume because inevitably it will only arise after the death of his mother. " He added that the Duchess of Cornwall, who is also interviewed in the documentary, "makes the point that this burden does not weigh heavily on his shoulders". The BBC has been given exclusive access to film Prince Charles, who turns 70 on 14 November. Also appearing on the programme, the Duke of Cambridge said he would like his father to spend more time with his grandchildren - Prince George, Princess Charlotte and Prince Louis. Prince William said, "when he&apos;s there, he&apos;s brilliant" but "we need him there as much as possible". The prince warned decades ago about human-induced climate change. It was controversial to some at the time, but now there&apos;s scientific consensus on the threat. On wildlife he rightly predicted a huge loss of species. He campaigned against rainforest destruction, and he&apos;ll be pleased at the recent focus on the impact of farming on forests, and therefore on the climate. His concern for soil sounded dotty to some observers, but it&apos;s now acknowledged that many areas face a crisis of soil degradation and loss. On these matters, the mainstream has flowed towards the future monarch. On GM crops, the prince remains in conflict with the scientific establishment. On other hobby horses, such as homeopathy and architecture, he has expressed opinion rather than fact - but still he&apos;ll have some people on his side. Published on Thu, 08 Nov 2018 10:18:45 GMT, © All rights reserved by the publisher.